Picture the following: You’re now in Mexico. It’s no ordinary day however, for it’s Dia de los Muertos, or as we know it in english, the Day of the Dead. Colorful skull face paintings and masks surround you, it’s an art on its own to oberve. Of course, we can’t forget delicious food. Love this description so far? Then you’ll definately love Mezcal TnT, Hamilton’s Mexican Cuisine Pride. 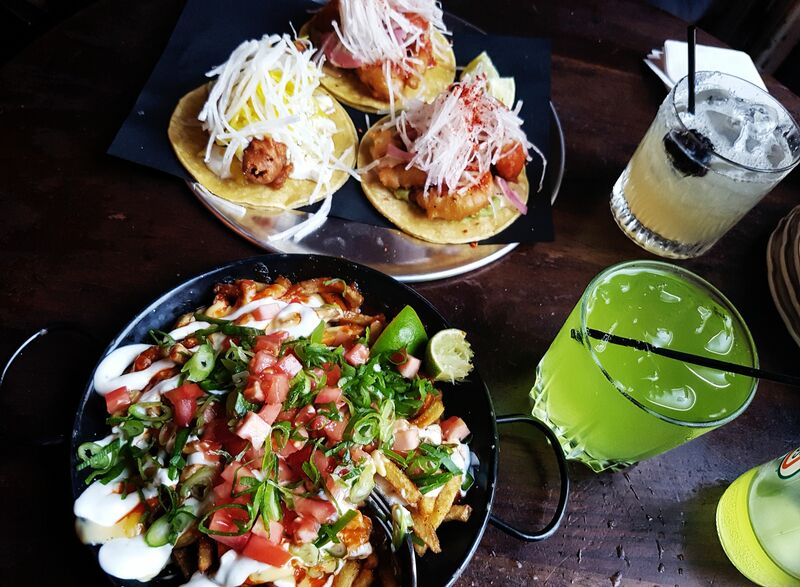 Mezcal TnT, a restuarant located in Hamilton Ontario that specializes in Mexican Cuisine, has definately won my heart for many reasons. From the moment you walk in, immediate Dia de los Muertos vibes. Dimmed lighting brought to life the beautiful artwork of Catrina (skull) figures and calavera (skeletons) along the walls, similar to those iconic in Dia de los Muertos. I LOVED it. I regret not taking any pictures myself of their beautiful decor, but if you’d like to see it with your own eyes, I’d suggest a) get going there as soon as possible or b) you can check it out on their instagram page here. The staff were incredibly hospitable, making sure we were well taken care of from the moment we walked in, quick to serve us drinks, offering us better seating once spots cleared up (it was pretty packed in the restuarant by noon thus proving it’s popular name), all the way up until even after we received our orders to make sure the food was okay. A1 for customer service! Another plus, shoutout to the choice of music at this spot, it’s always appreciated to have good music alongside good food. 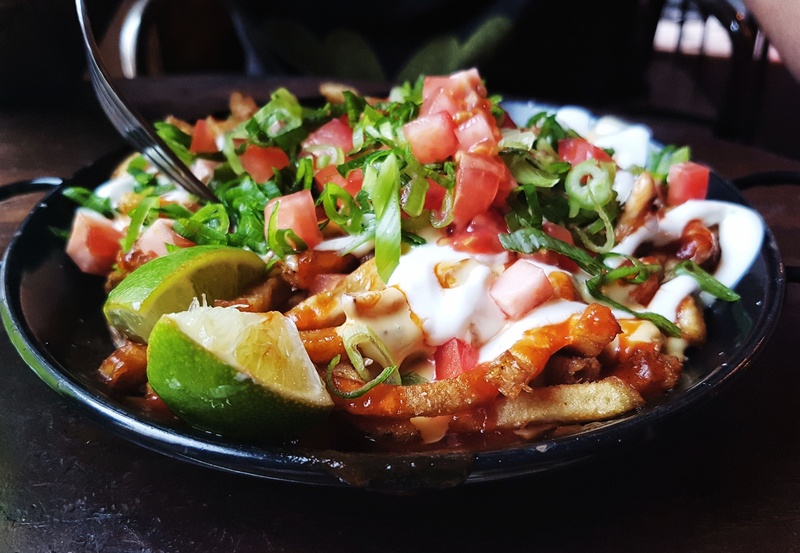 Mezcal’s menu speciality comprises of either tacos or burritos, where any taco flavour could be turned into a burrito ($6 per taco or 3 for $15, $9 per burrito). Upon our visit, we opted for the Baja Fish Taco and Bam Bam Shrimp Tacos. If you’re a fan of seafood, you’ll fall in love with both of these items. 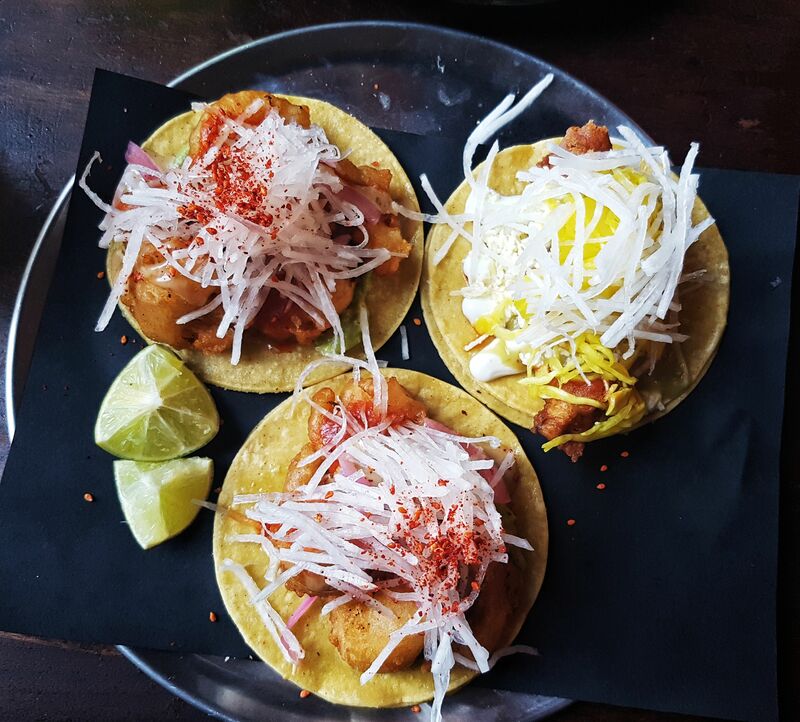 The Baja Fish Tacos consisted of beer battered cod, lime crema, tomatillo salsa verde, cotija, citrus cabbage, and charred tomato salsa fresca. 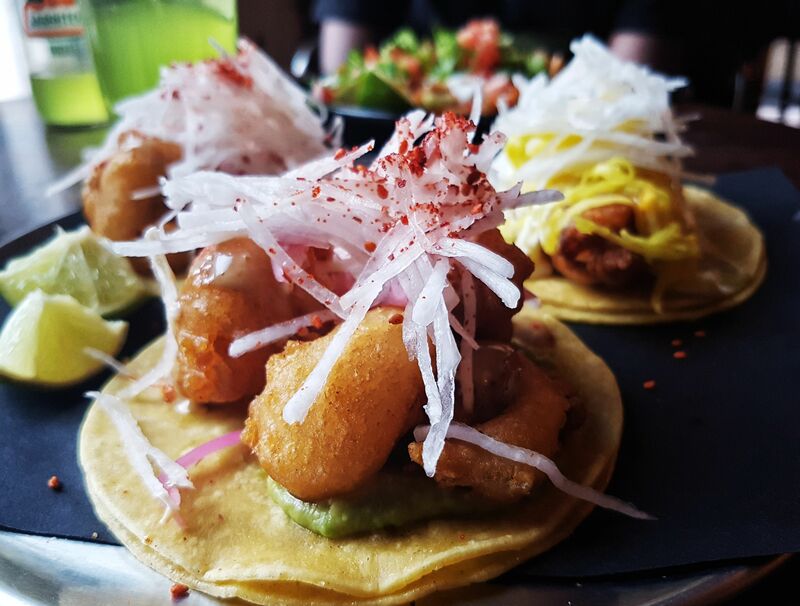 The Bang Bang Shrimp Tacos consisted of beer battered shrimp, guacamole, ponzu, ginger aoili, serrano rojo, and diakon. Crunchy, fresh, and packed with flavor in each bite, there was nothing not to love about these tacos. The portion size was also just right so nothing was falling apart in your hands. As a side, you had a choice between items such as Tuna Ceviche Tostada, Nachos, or even Cuban Styled Chicharrones and more. We decided to opt for the Fries Supreme (best decision ever x2, try it and you’ll thank me later). 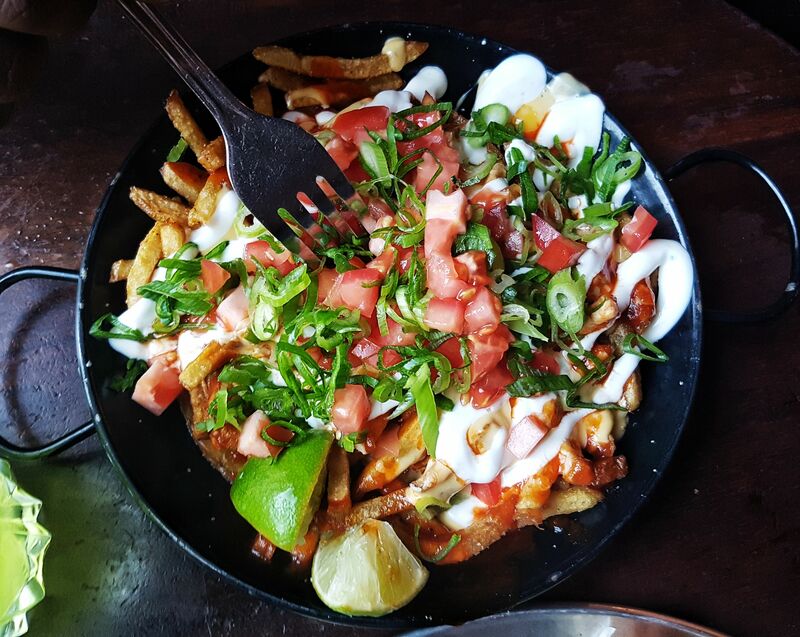 The Fries Supreme consisted of american cheese , tomato’s , scallions, and crema. With a saucy bite each time, and definately no lack of toppings, this side alone could fill you up as a full meal if you wanted it to! Of course, when talking about Mezcal TnT (Taco’s and Tequila), we can’t forget about the drinks menu. With over 11 different cockatils to choose from, I decided to opt for the Gin N’ Juice cocktail. This cocktail consisted of lavender & juniper infused El Jimador Blanca Tequila, St.Germaine Elderflower liqueur, fresh lemon juice , and white grape juice. Having never heard of the cocktail , I was hesistant to try it at first but trust me on this, the flavors work together AMAZINGLY. The lavender and juniper add a sweetness to the drink, and paired perfectly with the taco’s we ordered. It is a bit of a strong beverage, but then again that’s why all the food you order helps! All in all, if you want to experiance a get away to Mexico with all the right flavors and zero flight ticket hassles, you gotta eat here. Mezcal TnT is open Mon – Thurs 11:30am- 11:00pm , Fridays & Saturdays 11:30am-2:00am, or Sundays 11:30am-1:00pm, waiting on your arrival! This international eat is approved by yours truly – S.
When it comes to keeping cool for the summer, there’s a couple options available out there: a) ice cream, b) popsicles, or c) a nice ice cold drink. However, if you grew up in a South Asian household like myself, then you had access to one other option, d) Kulfi. In a bowl, combine the evaporated and sweet condensed milk. Next, take your cardamom pods, and pistachios, and slightly microwave the two until a light golden brown color. This provides a roasted effect, making it easier to grind both the cardamom and pistachios into a fine powder. This also increases the aroma of the two, which is crucial to the overall flavor of the kulfi. Next, using a mort and pestol, break open the cardamom pods and remove the skin, leaving behind only the cardamom seeds. Next, use a blender to grind together the cardamom seeds and pistachios into a fine powder. Mix this powder into the bowl with the milk mixture and stir well. Once combined, pour this mixture into either a popsicle mould, or a kulfi mold. These kulfi molds can be found at any south asian market. If not, a popsickle mold does just as well! Allow the kulfi to freeze atleast 6 hours or overnight before serving. Garnish with pistachio powder before serving as per taste. And there you have it! One creamy, cold, sweet dessert to keep cool this summer. Definately a must for any summer barbecues to finish off a long day. This summer sweet is approved by yours truly- S.
*Tip 1: Kulfi does not only have to be served as a popsicle. It can also be served in a similar fashion to icecream. Freeze the kulfi mix overnight in a bowl sealed with clean wrap overtop. This should give the same kulfi mix ready to be scooped and served! *Tip 2: Unlike icecream or frozen yogurt, the consistency of kulfi is slighty less thick. Therefore, be sure to be weary of a faster melting time when enjoying this summer treat! So let me start by saying, this eatery is a MUST try for many of the following reasons. The aesthetic of the place is amazing: bright inviting colors, plenty seating areas so there’s no need to stand while waiting on an order, and its a grab and go or dine in type of enviornment where either or works. The staff needless to say are the definition of good customer service, with smiles all around and a positive attitude. Even better was the fact that there was plenty enough staff to keep wait times short so you’ll have your order in no time. Now for the best part, the food. I personally opted for the Gringo’s Delight sushi burrito. It was a full packed meal and you’ll understand why just from what was inside: shrimp tempura, surimi crab, mango, jalapeño, avacado, lettuce, cucumber, nacho cheese, sriracha aioli, and last but not least, sweet sauce. Believe me when I say there was no pretty way to eat this burrito but it was worth every messy bite. For a side, I also decides to opt on their Poké nachos, which was definately my favourite. Likewise their sushi burrito, the Poké nachos were no short of toppings: crispy wontons, salmon, tuna, massago, avacado, corn, green onions, jalepeño, nori strips, sriracha aioli, sweet sauce, and nacho cheese. Each bite is fully packed, you get a tang of their sweet sauce combined with a crunch of the nori strips and all the other toppings. It goes to show that in any menu item, Su&Bu definately care about quality and quantity alike. The only thing to be weary of is the price, for instance, 2 full sushi burritos plus a side of Poké nachos came to a total of $39. If you’re willing to shell out the cash, it is 100% worth the price being paid. Overall, I would highly recommend this local eat to anyone who’s a fan of international cuisine and seafood, because Su&Bu provides exactly that and sets the bar well high. This local eatery is approved by yours truley, -S.
If you’re a fan of seafood, then you’re definately going to be a fan of this modern take on seafood classics, with a kick of asian fusion food. 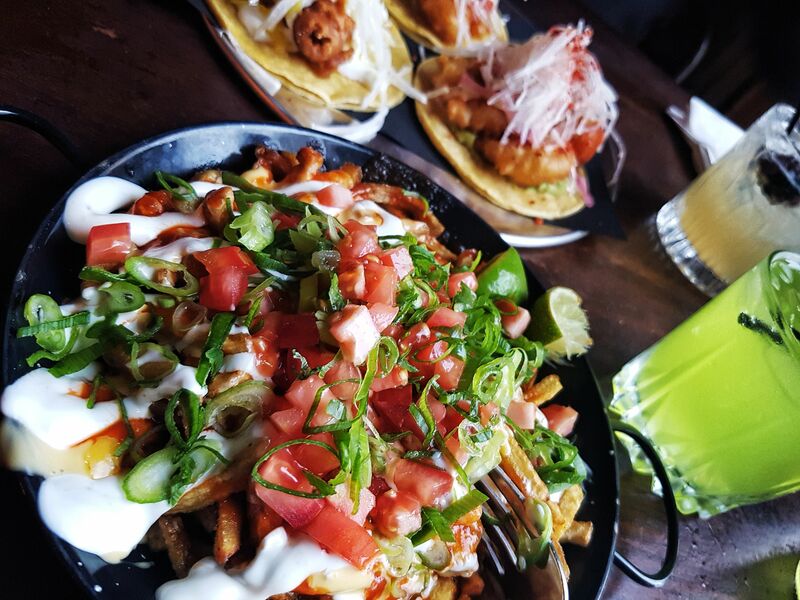 Located near Toronto’s very own china town, this local spot is the coziest seafood spot you’ll come across! My personal fav had was the lobster roll with coleslaw and house cut fries, definately worth the medium price range. The tang you get from the lobster mix and the citrus taste of the fries is unlike any other. Potential bite for this summer? Definately, savoury seafood approved by yours truley.